FULTON, NY – Oswego County Opportunities Executive Director Diane Cooper-Currier announces that G & C Foods is once again a Gold Level sponsor of OCO’s annual Bowl-A-Fun. G & C Foods has signed on as a Gold Level Sponsor for Oswego County Opportunities Intergalactic Bowl-A-Fun. 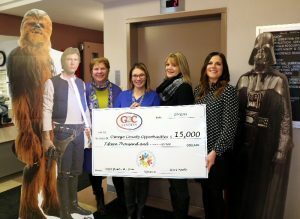 Flanked between some intergalactic celebrities are from left OCO Executive Director Diane Cooper-Currier, G & C Foods Director of Organizational Development Sara Johnson, G & C Foods Director of Operations Diane DiSanto, and OCO Development Coordinator Bridget Dolbear. To be held May 4 at Lakeview Lanes, 723 W. Broadway in Fulton OCO’s Bowl-A-Fun embraces its date of May the fourth by featuring an intergalactic theme. Proceeds from the event will support OCO’s effort to do “whatever it takes” to help families succeed through empowerment, support, and connecting them with the resources that can help them do so. G & C Foods joins Gold Level sponsor National Grid and Silver Level sponsors Community Bank N.A., Glider Oil Co. Inc., and the Shineman Foundation in supporting OCO’s Bowl-A-Fun. OCO’s Bowl-A-Fun offers a morning and an afternoon flight. Team spots will be filled on a first come, first served basis. Secure your team’s spot today by visiting www.oco.org for a registration form. Registration is $100 for a bowler or $500 per team. Sponsorship and corporate team opportunities are also available. 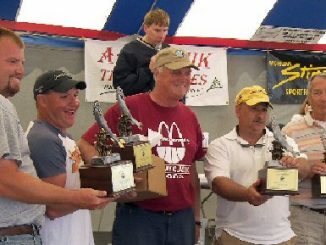 For more information on team registration, donations and sponsorships visit www.oco.org or contact the OCO main office at 315-598-4717.